Earlier today we had a bit of a fire-drill at TechCrunch Headquarters. As I checked into TCHQ on Facebook Places, I also tagged a few of my coworkers, fully expecting their checkins to be delayed until they actually opted into the feature for the first time (unlike some of Facebook’s past controversial feature launches, you have to Opt-In before you can be tagged in Places). Except, as we quickly discovered, you really don’t have to opt in before you can be tagged. As soon as I checked in on Places, Facebook published News Feed items to my friends indicating that I’d checked in with my coworkers — even the coworkers who hadn’t yet opted into Places. My coworker received an email asking him to confirm the tag, but he had never clicked it. And yet, many of his friends were being notified that he’d just checked into Techcrunch HQ with me. Convinced that this was a privacy flaw I flagged down Facebook PR, who patiently explained to me that this is actually the way things are supposed to work. Huh? Turns out, there are three different stages of opting into the service. Let’s spell them out. 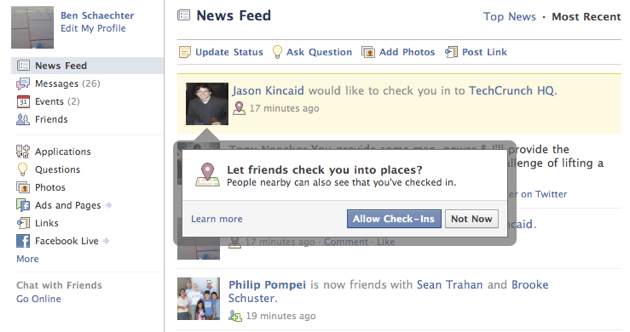 Option one: You’ve explicitly opted into allowing people to tag you into Places. Any of your friends can do this. Pretty straightforward. Option two: You’ve braved the muddled waters of Facebook’s privacy control panel and turned off Places entirely. You can’t be tagged — if a friend does try to tag you in a Places post, your name simply won’t show up in the post. Option three: If you’ve never decided to ‘Allow’ your friends to tag you, but you haven’t blocked the Places feature entirely, you’re in a sort of limbo. This is where the vast majority of Facebook users in the US are right now. As soon as they get tagged for the first time, they’ll get an email and a prompt on Facebook itself asking them if they’d like to allow their friends to tag them at Places in the future. Accepting this will allow any of your friends to tag you unless you go into your privacy settings and cancel it (see Option one).But even if you hit the “Not Now” button, you’ll still be tagged in the relevant Places update. In fact, you’ll still be tagged even if you haven’t even seen the prompt asking you to approve Places tags. Facebook treats this as if you were tagged in a basic status update so it will show up on your Wall and your friends’ News Feeds — you just aren’t associated with whatever Place your friend was tagging you into (i.e. if your friend visits the venue’s Place page, they won’t see that you’ve previously checked in there). The logic here is that your friends could manually tag you in a normal status update anyway. Update: Facebook has clarified that it doesn’t show up on your wall. Update 2: Facebook has clarified further. The status update will only appear in the News Feeds of friends whom you share in common with the person tagging you at the Place, not to all of your friends. Facebook has just posted a video explaining this, which you can watch here. From Facebook’s standpoint this makes sense, but it’s confusing as hell to users — generally when you opt out of being tagged somewhere, you’d probably expect not to be tagged there at all. For what it’s worth, Facebook knows this is confusing — they’re planning to release a video explaining it in the near future. Still, I think the site should hide any location tags until a user has explicitly said they want to be associated with them.